Searching for Puerto del Carmen villas for rent? Then browse our selection of holiday villas in Puerto del Carmen, Lanzarote's oldest and most popular resort, which is located midway along the warm and sunny southern coastline of the island around ten to fifteen minutes drive from the airport at Arrecife. 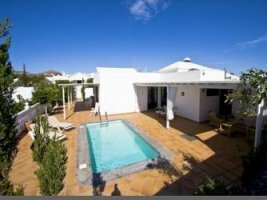 Puerto del Carmen is home to an excellent selection of holiday rental properties and boasts some of the best villas in Lanzarote located in areas such as Los Mojones and Los Pocillos. Puerto del Carmen also offers great beaches as well as excellent nightlife and an abundance of restaurants. The resort is basically divided into two halves, the Old Town and the New	Town. The Old Town revolves around the harbour area, which is a great spot to head for if you are looking for atmospheric restaurants or boat excursions along the coastline and to the neighbouring island of Fuerteventura. We offer a large selection of villas in Puerto del Carmen for rent - in popular areas such as Los Mojones and Risco Prieto, which is located just above the Old Town Harbour. As well as plenty	of holiday rental properties in the centre of this bustling resort. Providing you with a wide range of Puerto del Carmen holiday villas to select from. You can view our entire range of Puerto Del Carmen villas below. Most boast their own private pools with quality furnishings and some will also have their own spas as well as other mod	cons. So just browse our selection of villas in Puerto del Carmen and book your holiday in Lanzarote direct online. Modern style bungalows close to the beach at Los Pocillos. Two bedrooms, one bathroom, sleeps up to five people. Villa Lauren offers good value villa accommodation and is located in the Los Mojones area of Puerto del Carmen. Villa Hannah is perfectly equipped to provide the ideal holiday accommodation and is one of the best villas in Puerto del Carmen Old Town. Casa Maria boasts a private swimming pool and a central location in Puerto del Carmen, close to the amenities. Located in the prestigious area of Los Mojones, Villa Felicity offers quality accommodation and a wonderful private walled garden with pool. Villa Nadine is a light and airy, tastefully furnished private luxury property and one of our most popular Puerto del Carmen holiday villas. A stylish modern villa in the Los Mojones area of Puerto del Carmen. Villa Julia is set within large private gardens and offers luxurious accommodation in the heart of Puerto del Carmen. Villa Diana offers very comfortable holiday accommodation, with private pool, in the heart of Puerto del Carmen. Villa Penelope is located in Los Mojones and is beautifully finished both inside and out to provide the ideal holiday accommodation.